Dimensions 0.75 by 5.75 by 8.25 in. The successful trial lawyer and author of How to Argue and Win Every Time presents a step-by-step plan for speaking effectively in public, covering such strategies as overcoming fear, owning one's feelings, and making effective closing arguments. Reprint. 25,000 first printing. Gerry Spence is perhaps America's most renowned and successful trial lawyer, a man known for his deep convictions and his powerful courtroom presentations when he argues on behalf of ordinary people. Frequently pitted against teams of lawyers thrown against him by major corporate or government interests, he has never lost a criminal case and has not lost a civil jury trial since l969. 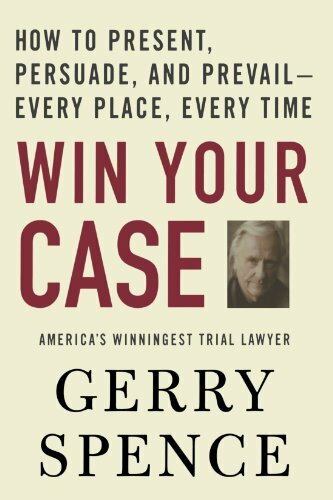 In Win Your Case, Spence shares a lifetime of experience teaching you how to win in any arena-the courtroom, the boardroom, the sales call, the salary review, the town council meeting-every venue where a case is to be made against adversaries who oppose the justice you seek. Relying on the successful courtroom methods he has developed over more than half a century, Spence shows both lawyers and laypersons how you can win your cases as he takes you step by step through the elements of a trial-from jury selection, the opening statement, the presentation of witnesses, their cross-examinations, and finally to the closing argument itself. Spence teaches you how to prepare yourselves for these wars. Then he leads you through the new, cutting-edge methods he uses in discovering the story in which you form the evidence into a compelling narrative, discover the point of view of the decision maker, anticipate and answer the counterarguments, and finally conclude the case with a winning final argument. To make a winning presentation, you are taught to prepare the power-person (the jury, the judge, the boss, the customer, the board) to hear your case. You are shown that your emotions, and theirs, are the source of your winning. You learn the power of your own fear, of honesty and caring and, yes, of love. You are instructed on how to role-play through the use of the psychodramatic technique, to both discover and tell the story of the case, and, at last, to pull it all together into the winning final argument. Whether you are presenting your case to a judge, a jury, a boss, a committee, or a customer, Win Your Case is an indispensable guide to success in every walk of life, in and out of the courtroom. Reprint edition from Griffin (November 28, 2006); titled "Win Your Case: How to Present, Persuade, And Prevail---every Place, Every Time"
About: The successful trial lawyer and author of How to Argue and Win Every Time presents a step-by-step plan for speaking effectively in public, covering such strategies as overcoming fear, owning one's feelings, and making effective closing arguments. About: Presents a step-by-step plan for speaking effectively in public, covering such strategies as overcoming fear, owning one's feelings, and making effective closing arguments.